Do these moves for an even stronger core. Golf, hockey, and tennis players spend a lot of time twisting; the movement is key to their success. But if your sport doesn’t demand the motion, the better way to strengthen your core is by resisting rotation, says David Otey, personal training manager at Equinox Sports Club in New York City. While you might do some cable chops or bicycle crunches, your core's main responsibility is to stay stable, like while running or lifting. That's why you can benefit from doing moves that keep your core centered while the rest of your body works in all planes of motion. The three exercises below do just that. Complete 2 to 4 sets of 8 to 12 reps of each, resting for 30 to 90 seconds between sets and exercises. Stand with your feet shoulder-width apart and hold the end of the bar with both hands, fingers clasped, just above your head and in front of you. (Take a few steps back, if necessary, so that your arms are extended.) Keeping your shoulders and hips squared, bring the weight across your body to the right, then immediately bring it the left. Return to start for one rep. Attach a resistance band or cable at your right side around shoulder-height. Resistance should be set depending on strength. You should be able to reach the full extension of the movement standing upright with your feet close together, without tilting or compensating. 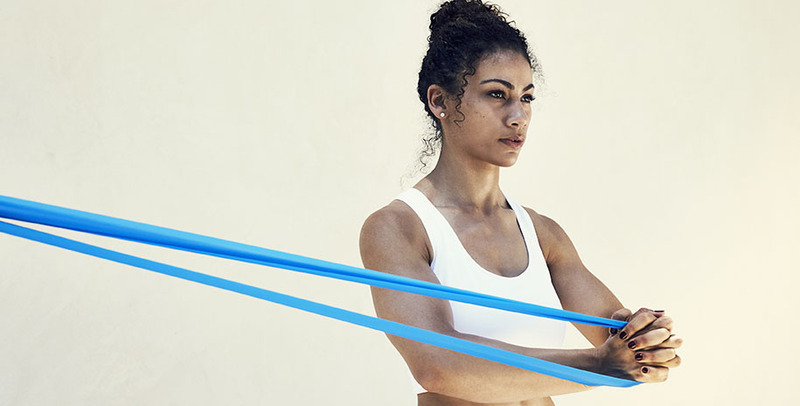 Pulling the band or cable, keep your feet close together and bring your hands, with arms straight or bent, in front of your ribcage. Hold for 30 seconds. Engage your core and breathe normally. Perform all reps on one side, then repeat on the opposite side. Anchor a band to a solid attachment point. Position your body two to three feet away, holding the band with both hands close to your chest. Get into a split stance (one foot forward and one foot back as if you’re doing a static lunge). Sink down into a split squat. Return to standing, keeping your feet in a narrow split stance, and press the band out in front of body. Draw it back in before descending into the next split squat. Resist pull of the band and maintain position. Do all reps on one side, then repeat on the other side.